Epimedium x perralchicum 'Frohnleiten' in mid-May 2015 with another rosy flush of new foliage emerging. It's been a while since I've posted any groundcover reviews, but I'd like to dive back into that genre with a quick snapshot of Epimedium x perralchicum 'Frohnleiten'. I believe I added a small (3.5-inch?) pot of 'Frohnleiten' to my garden a couple of years ago, in the spring of 2013. By autumn of that year, I was ready to declare failure and put 'Frohnleiten' on my list of "Groundcovers that have not worked at all". That first year, the plant sulked, the foliage crisped, I was unimpressed. I nearly gave up too soon. By April of last year, I had changed my tune. I included 'Frohnleiten' in a post on beautiful spring flowers -- except that I wasn't highlighting the Epimedium's little yellow flowers (it didn't really bloom until this spring) but rather its dazzling new pink foliage that's as pretty as many flowers. In May of the same year, I spotlighted 'Frohnleiten' again for its beautiful foliage. Finally, in October of last year, my eyes were opened to the full potential of Epimedium as a groundcover when I saw E. x. versicolor 'Sulphureum' used to marvelous effect as a groundcover at the Berlin Botanical Garden. 1) Evergreen: I tend to prefer evergreen groundcovers for several reasons. First, they provide winter interest. Second, they shade out the soil year-round to prevent weed seeds from germinating and gaining a foothold. Third, they make it easier to plan a garden bed. With deciduous groundcovers (e.g., hardy blue plumbago), I'm never quite sure where it will pop up next spring or how fall it will spread. With an evergreen groundcover, I have an easier time figuring out where to place new plants so they will complement each other. 2) Non-aggressive: Perhaps I'm speaking too soon (it's only been in the garden a couple of years and could perhaps become more pushy as it matures), but so far 'Frohnleiten' has been well-behaved. This can be frustrating in the first year or two when you want the plant to spread faster, but as I've learned from other ill-fated encounters with more aggressive groundcovers (e.g., creeping raspberry), having a groundcover that spreads at a measured pace can be a blessing later on if you want it to play nice with other perennials and don't want to constantly have to be fighting to keep it in place. 3) Beautiful: OK, this is subjective, but then much of this whole blog is subjective! Still, I like most everything about this Epimedium - the shape of its leaves, the hue of the mature green foliage, the cute sprays of little yellow flowers (which unfortunately I neglected to photograph for this post) and especially the rosy new foliage that at least this year seems to emerge over a period of months. It's true that (at least in Tennessee zone 6/7), the old foliage will get pretty crispy by the end of the winter, but I'd say it stays looking good almost all the way up until the new foliage is ready to emerge. 4) Good job of suppressing weeds: Not every groundcover is equally good in this regard, but 'Frohnleiten' seems to be an effective weed suppressor, which is one of the major roles I want a groundcover to perform in the garden. 5) Thrives in dry shade: I don't have all that much shade in my garden, so usually I'm more preoccupied with finding plants that can handle the hot Tennessee sunshine, but from what I understand, it's hard to find plants that can cope with dry shade. Epimediums are supposed to be champs in that regard and mine certainly seems unfazed by droughts now that it has gotten established. I think it's also happier now that other shrubs and perennials have grown up around it, giving it a shadier setting in which to do its thing. At least in Tennessee, it seems like 'Frohnleiten' in particular (and I'd guess Epimediums in general) prefer shady spots. Perhaps further north it can handle a bit more sunshine? 6) Low maintenance: There's no need to deadhead the flowers or even cut off the flower stalks - they just seem to disappear once the flowering season is done. Similarly, the previous year's foliage becomes so brittle that it simply crumbles and disintegrates around the same time that the new foliage emerges. (I cut off or break apart the old foliage with my hands in early spring to make way for the new leaves, but I'm not sure that's really necessary. I may try skipping that step next year just to see what happens.) So overall, it has a really clean, fresh look. This is in contrast to another groundcover I like - lamb's ear (Stachys byzantina), whose old dead foliage looks rather the worse for wear through the winter and then persists for quite a long time beneath the new foliage. And while creeping raspberry's long creeping stolons were a maintenance headache, 'Frohnleiten' seems to stay quite compact, sending up new shoots only in the immediate vicinity of the established clump. 7) Deer and rabbit resistant: I have at least one bunny rabbit living in my front foundation bed. It runs past the Epimedium everyday. Fortunately, 'Frohnleiten' has been spared the rabbit's nibbles. Rabbit-resistance is a key consideration around here. 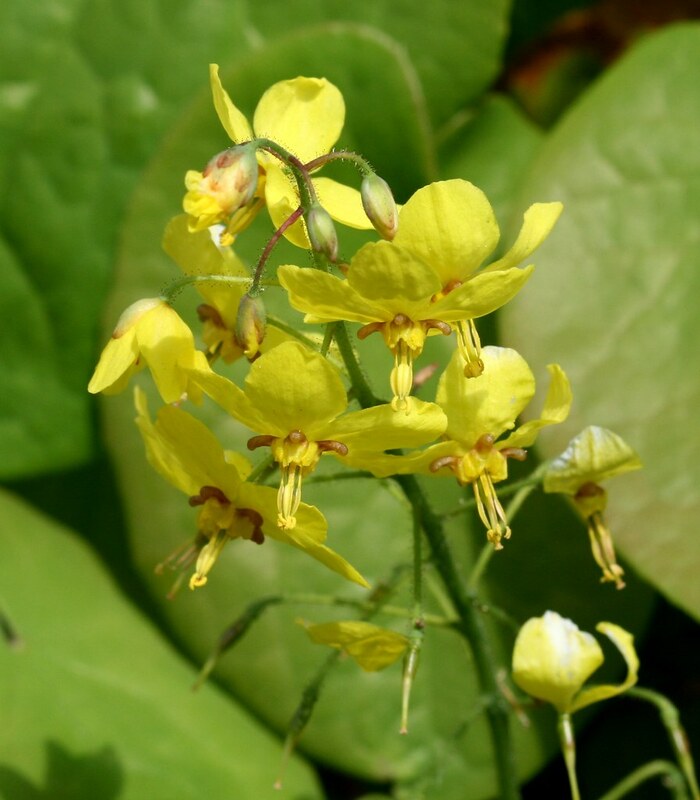 8) Wildlife value: The Pacific Bulb Society says that Epimedium flowers produce nectar to attract pollinators (although I must confess that I don't think I saw any pollinators visiting the flowers on my little patch of 'Frohnleiten' this year). Seeds are attached to an elaiosome - a packet of lipids and proteins - which may induce ants to gather the seeds and take them back to their nests to feed their larvae, thus distributing the seeds and propagating the plant in the process. 9) Troublefree: Missouri Botanical Garden says that 'Frohnleiten' has "no serious insect or disease problems." Yep, that about sums it up for me. Something (slug? leafcutter bee?) may occasionally slice off part of a leaf, but generally 'Frohnleiten' seems tough, vigorous and resilient. 1) Exotic: I tend to prefer to garden with native plants. According to Missouri Botanical Garden, 'Frohnleiten' is a hybrid between E. perralderianum (native to Algeria) and E. pinnatum subsp. colchicum (native to northern Iran). 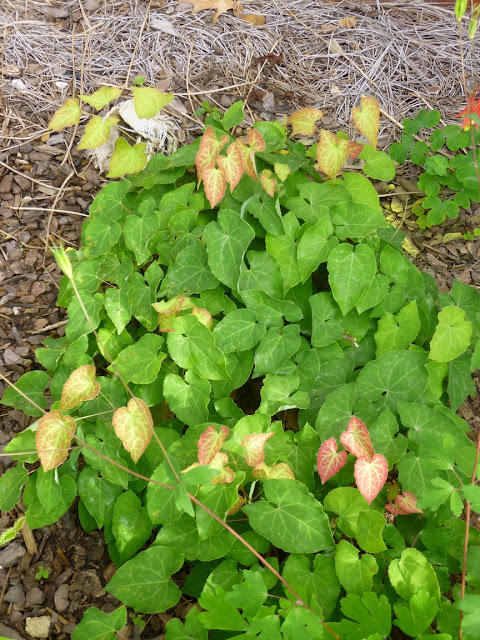 Still, I've never read about Epimedium acting invasively. In fact, the Chicago Botanic Garden recommends Epimedium species as good alternatives to invasive goutweed (Aegopodium podagraria). Epimediums are not exactly flashy, but 'Frohnleiten' at least seems to be a solid, reliable, dependable performer that performs admirably as a groundcover and just keeps getting better every year.